This is my first attempt @ a Jacket Card using a template from Lyn's challenge @ PCP as a jumping off point. I made a few adjustments along the way. I think it turned out pretty spiffy. I used brown striped paper for the shirt, brown cardstock for the jacket and blue satin ribbon for the tie. Hubby and I had found a cute 'SNOOPY - ACE' tie tack @ Value Village earlier this spring and had to buy it for his dad because he flies airplanes and has a collection of 'Snoopy - Ace' items. So this turned out to be the perfect way to present him his tie tack. Much cuter than in a box I think. I was so pleased @ how easy this was to put together and how well it turned out. I rounded the corners on my card @ the shoulder point and the jacket front bottom center. It was an after thought - I like the idea of the shoulders being rounded off instead of sharp square edges. Of course my corner punch couldn't go through all these layers so I hand cut the corners. Next time I will round the pieces before hand now that I know I like the soft rounded shoulders. I made some modifications to the collar too - cut it longer and gave it some body to curve it and give it more of a 3d shape. Only wish I had some teeny tiny buttons to add for even more detail. Oh and I also did my own take on the jacket collar as I wanted it to carry upward and over the shoulders like a real jacket. I made some Tim Holtz tickets and just hand penned the details. I turned them into little coupons that dad can use for a home cooked meal and dessert on us. The third just says Happy Father's Day and has todays date on it. I will do this one again. 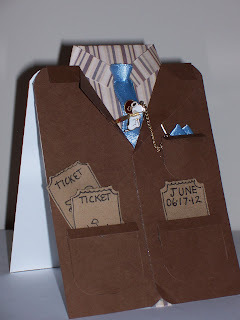 If your on PCP (PAPER CRAFT PLANET) check out LYN'S tut otherwise you can find them online. ABSOLUTELY FABULOUS. Simply AWSOME. Love it and your FIL will too.